If you’ve ever wondered why rainfall wasn’t enough to clean your driveways from debris, the answer has to do with how porous concrete and paved surfaces can be, allowing dirt to easily build up and making it harder to wash away. Fortunately, pressure washing is a proven method to help extract dirt from the pores of concrete and paved surfaces, allowing for clean entry of cleansing water. Enlisting the help of pressure cleaners to clear your driveway has benefits on its overall appearance. When small bits of dirt or rocks are able to build up in the pores of your driveway, it can create a muddied appearance on its surface or from afar. Pressure cleaning can rid this look and give it a pristine finish that is desired. As concrete can easily becomes stained over time, either with gasoline, oil, or other elements, pressure washing is a professional way to remove such stains. It tackles the stain head on and removes it individually from each crevice in the concrete or pavement, leaving you with even toned concrete that looks brand new. Upkeep of your driveway is important to maintain its appearance, functionality, and to reduce the costs associated with driveway repairs. Pressure cleaning serves as a fantastic way to incorporate your driveways maintenance into your to-do list. It’s easy when performed by professionals and can be done in as little as one day. Pressure cleaning is a surefire way that has been proven to adequately enhance the livelihood of your driveway and keep it clean for long periods of time. It successfully removes hard-to-reach debris and reduces the probability of potential damage due to neglect. As seasons change, the steps we take to keep safe access to our driveway do too. For example, in the Winter, many residents often sand or salt their driveways so create traction for vehicles during snow and ice. However, while salt can easily melt away over time, sand is slightly more difficult to remove. Pressure washing can easily help remove sand or divert when the season has passed and the sand remains. 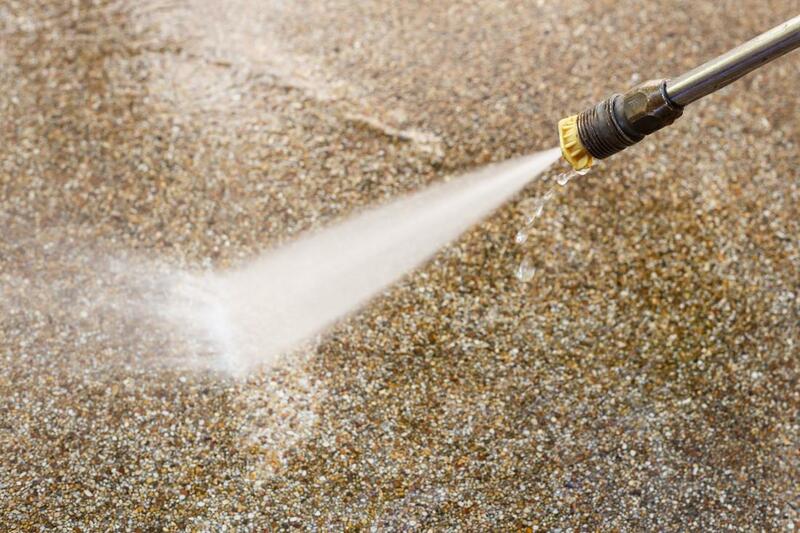 If sand particles are trapped inside the porous concrete, we can also help to remove them with pressure washing to give your driveway a fresh finish for the new season. If your driveway is placed under trees that tend to shed excessively or bird droppings have continually lingered around it, pressure cleaning can easily remove these elements without issue, allowing you to not worry about scrubbing your driveway to remove messes. Regular pressure cleanings can help concrete and paved surfaces maintain a longer shelf life. As concrete has a tendency to crack, it is beneficial to keep it clean often to avoid cracking, crumbling, weeds, and excessive dirt. We also recommend regularly sealing your driveway, even after pressure cleaning, as this will ensure that your driveway remains sturdy and stable, long after the cleaning process has been completed or until the next one.